Spicy ground meat, potatoes, onions and leek refined with spread cheese. One package is sufficient for 14.1 oz of leek, 8.82 oz of ground meat and 7.05 oz of creamy spread cheese. Spicy ground meat, potatoes, onions and leek refined with spread cheese. MSG-Free. Clean leek and cut into fine rings. Brown ground meat in some hot oil. Add leek rings and sauté briefly. Add 3 1/4 cups (25.4 fl.oz) of warm water, stir in contents of this package and bring to a boil while stirring. Stir in the spread cheese. Cook for about 15 minutes on medium heat. Stirring occasionally. Tip: Fresh bread or baguette goes very well with this dish. 64g / 2.26oz NET. WT. Potatoes, palm oil, starch, 12% onions, 6% iodized sea salt*, seasoning, salt, scallion, LACTOSE, MILK PROTEIN, flavors, salt substitute**, sugar, spinach, white wine extract, pepper, turmeric extract, yeast extract, parsley root, dextrose. *70% sea salt in the added salt. **Extracted from natural minerals of potassium. 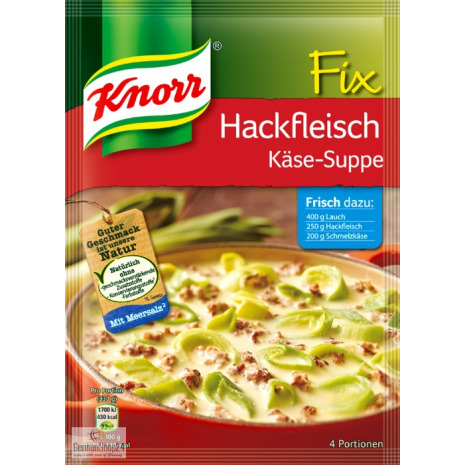 Kartoffeln, Palmöl, Stärke, 12% Zwiebeln, 6% jodiertes Meersalz*, Würze, Speisesalz, Lauch, MILCHZUCKER, MILCHEIWEISS, Aromen, Kochsalzersatz**, Zucker, Spinat, Weißweinextrakt, Pfeffer, Curcuma, Hefeextrakt, Petersilienwurzel, Dextrose. 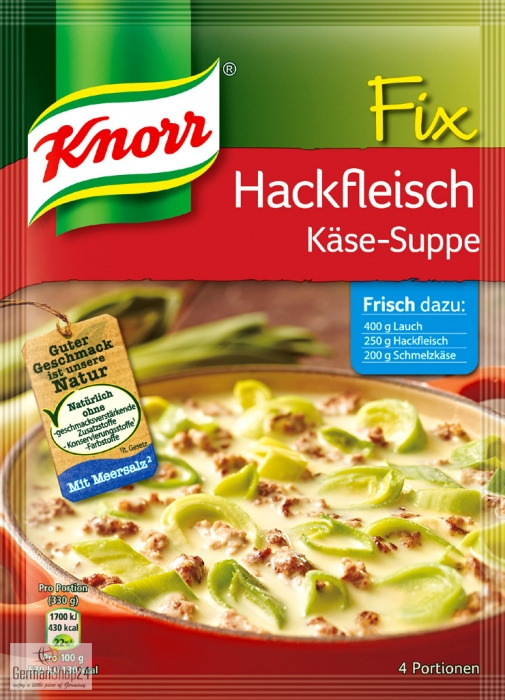 *70% Meersalz im zugesetzten Salz. **Gewonnen aus natürlichen Kaliummineralien.